Canadians have always embraced KISS. In the shock rock band’s early days, Paul Stanley, Gene Simmons, Ace Frehley and Peter Criss were playing rooms a far cry from the arenas and stadiums they are now known to fill with pyro and solid rock thunder. Forty years later and with a 20th studio album in tow — the old school, Detroit-style rocker Monster — little has changed about KISS’s philosophy: Rock and roll all night, party every day. Doing so, KISS continues to offer a fan-oriented experience like no other band can, a recipe that has generated millions of KISS Army members, and licensing and merchandising revenue like few acts on the planet boast. A number of the pop-up stores have appeared across the country in some of the cities where the band will be stopping: Victoria, Edmonton, Calgary. If in 1973 KISS’s brand of hyper-sexualized, overly macho rock draped in leather costumes and trademark symbolic characters makeup were made to shock — Stanley’s Starchild, Simmons’ Demon, Frehley’s Spaceman and Criss’ Cat Man — today the band is an instantly recognized and respected entity. Buoyed by its fan base, KISS was a modest shocker hit early on. Albums like KISS (1973), Hotter Than Hell (1974) and Dressed To Kill (1975) contained more than a few songs now considered band classics (Strutter, Deuce, Rock and Roll All Nite), but it wasn’t until the band’s first live album Alive! that things really took off, thanks to a concert-styled compilation featuring KISS’s singular live energy and a raw, nerve-slicing edge courtesy of producer Eddie Kramer. A slick re-invention thanks to Bob Ezrin (Alice Cooper, Pink Floyd) with 1975’s Destroyer made them a band that would hit the top of the charts with Beth, a decidedly un-KISS piano ballad sung by Criss. The ’80s and ’90s were not as glorious: The band removed the masks, faced upheaval and multiple lineup changes, and faltered. It wasn’t until they put the makeup on again that KISS thrived once more, finding renewal via 1998’s Psycho Circus (which yielded the first concert experience incorporating 3-D visual elements) and continuing via the solid Sonic Boom (2009) and last year’s surprising Monster, the latter two produced by Stanley and Greg Collins. Simmons heaped praise on Stanley’s design of the band’s latest live show, which features a spider-like stage construction that’s arguably the most advanced KISS fans have ever seen. 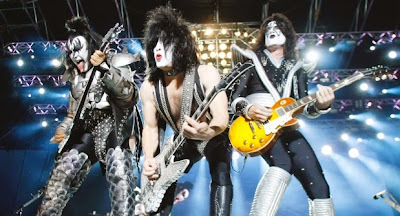 Stanley made it clear that even though the band’s current band members may one day call it quits (Eric Singer now sits behind the drums instead of Criss and Tommy Thayer plays Ace Frehley’s licks), he would like KISS to live on forever. “I think I’m really great at what I do but I don’t think there isn’t someone else that can do it at least as well,” he said. KISS plays the Scotiabank Saddledome Friday at 7:30 p.m.